It’s a tiny island in the South Pacific Ocean. Its closest inhabited neighbour is Pitcairn Island – some 2,075km away. That’s like Bucharest being London’s nearest neighbour. Chile is the nearest continental land mass to Easter Island – 3,512km to the east, nearly 6 hours flying time! Now that’s what you call remote! It is roughly 64 square miles of volcanic rock formed from a series of volcanic explosions. The highest point is Mount Terevaka, 600m high. The first human settlers, known as the Rapa Nui, were from Polynesia, not South America as was believed for a long time. This has now been proven through DNA testing on human skeletons from the island. The Rapa Nui brought sugarcane, bananas, taro, paper mulberry, chickens and rats with them. There is still much debate about when they arrived – with dates suggesting anywhere between 300 and 1200 AD. Nothing to do with the chickens! Instead, it was named by Dutch explorers who landed on the island on Easter Sunday in 1722. They were the first Europeans to reach the island and James Cook was the first British visitor in 1774. When were the Moai statues carved and how many are there? The giant stone figures were carved and erected roughly between 1250 and 1500 AD. Half of them are still at the quarry site but nearly 900 were transported to different sites around the island. Around a third were placed on stone platforms called Ahus which were situated about half a mile apart forming an almost unbroken line around the perimeter of the island. Another 600 statues, in various stages of completion, are scattered throughout the island. Some of the most striking and most photographed are those buried into the slopes of a volcanic hill, leaving just their heads showing. Excavations have proved that they do indeed have bodies below the surface! What were they made from and how big are they? They were carved from Tuff (a compressed volcanic ash). On average they are 4m high and weigh in at around 12.5 tonnes. The tallest finished Moai was 10m high and weighed 82 tons whilst the biggest unfinished statue would have been an incredible 21m high and weighed an enormous 270 tonnes. No wonder they didn’t finish carving it. Recent theories believe that they were representatives of dead ancestors as well as the embodiment of powerful chiefs – both living and deceased. Some of the statues have a red stone hat or topknot – this is believed to symbolise the hair of chieftains giving the statue additional power and status. The statues mainly faced inland – supposedly watching over the people – except for seven that are looking out to sea. We still don’t really know for sure. Most likely it involved some combination of ropes, log rollers, wooden ‘sleds’ and a great deal of manpower. Numerous experiments have been carried out to try and transport statues using only the resources available at the time. None so far have been successful although in 2011 two American universities proved that a 3m high maoi weighing 5 tonnes could be moved in an upright position by just 18 people using three ropes, elbow grease and a great deal of teamwork. Why have so many toppled over? At some point after the arrival of the first European visitors in 1722 all of the Moai were toppled from their upright positions. 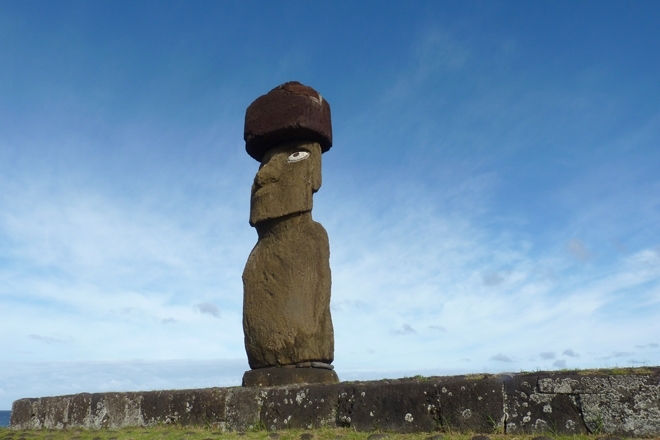 This is believed to have been a deliberate act on the part of the Rapa Nui people whose civilization entered a period of civil war, destruction and decline possibly due to the lack of food and fuel. The island had become deforested maybe due to the Rapa Nui cutting or burning all the trees down over time to clear land for farming or, alternatively, the trees were destroyed by rats! The jury's still out on that one. The statues that now stand upright have been re-erected by scientists and research teams. 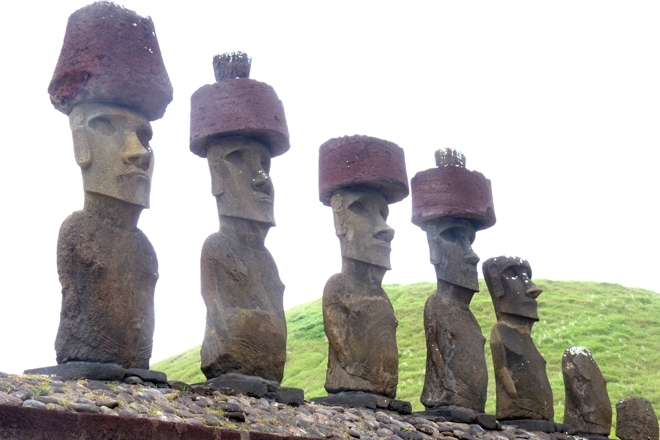 What happened to the Rapa Nui people? 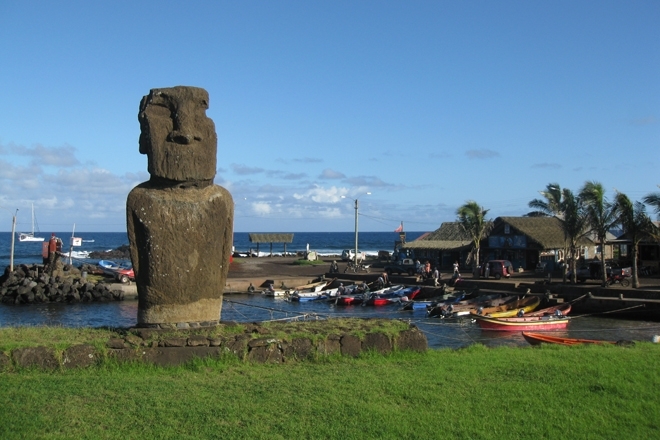 The eventual decline of the Rapa Nui is a very sorry tale indeed. The slave trade of the mid nineteenth century devastated the remaining population leaving behind mainly the sick, injured and elderly. In turn they were vulnerable to Christian missionaries and their identity and cultural history was systematically destroyed or eroded. Finally, the Rapa Nui were forcibly moved from their tribal lands which were used by settlers for farming. Eventually, all native blood died out. 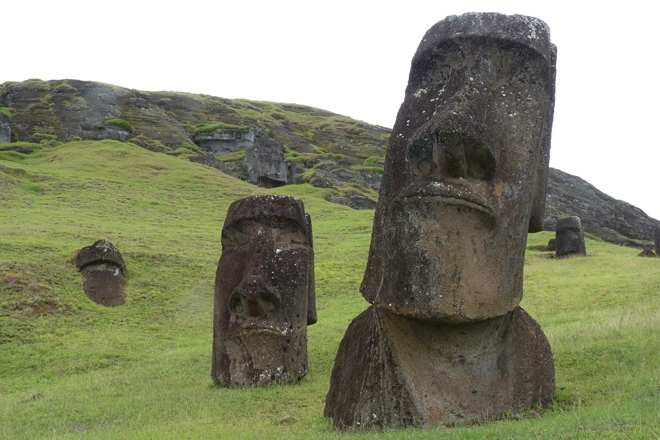 What's happening on Easter Island today? From the middle of the twentieth century extensive investigation of the Maoi statues and the Rapa Nui people were undertaken. Many statues have been preserved, restored and re-erected as has a ceremonial village. In 1994, Easter Island was made a UNESCO World Heritage Site and studies continue today that may one day solve the remaining mysteries of the Moai of Easter Island. If you’d like to try unravelling the mysteries for yourself, then take a look at our three Easter Island walking holidays. Each combines a week on Easter Island with time spent seeing some of the main scenic attractions of the Chilean mainland.